Grammy®-Nominated Jazz vocalist Jane Monheit shows her prowess as a singer as well as a songwriter with her latest release, The Heart Of The Matter on the Emarcy/Decca Records label. Celebrating her career and her 11th release, The Heart Of The Matter brings passion front and center. Jane Monheit - The Heart Of The Matter was produced by arranged by Gil Goldstein, who also plays accordion and electric guitar on the CD released on the Emarcy/Decca Records label. Decidedly different from her last release, Home, Jane writes, "This album is really different from my last. I knew it was time for the focus of a project to be lyrical interpretation...over the years, it's become the most important part of my approach to music. The songs were chosen for just that reason...I didn't worry about genre of style...just that each song dealt with a message I wanted to share or story I wanted to tell." The 14-track release opens with the Buffy St. Marie song, Until It's Time For You To Go, which has a decidedly French feel to it, with Gil Goldstein on accordion and Richard Locker and Rogerio Bocatto on cello. Shifting gears, Jane takes the listener down to Brazil with a change in tempo with the song, Dependes De Nós, (Depends on Us), written by Brazilian Latin-Grammy® winner musician, composer, singer Ivan Lins, where she sings his expressive lyrics in Portuguese, complemented by Neal Miner on bass, Rick Montalbano on drums, Romero Lubambo on guitar, Gil Goldstein on accordion, Rogerio Bacatto on percussion, Sheryl Henze on bass flute, Barry Crawford on alto flute, and Richard Locker and David Eggar on cello. Next in the line-up is Little Man You've Had A Busy Man written by Maurice Sigler, Al Hoffman, and Mable Wayne, followed by the song, Two Lonely People - music by Bill Evans and lyrics by Carol Hall, where Jane is joined by Gil Goldstein on electric piano, Sheryl Henze on bass flute, and Kathleen Nestor on alto flute. Jane takes the listener back to Brazil with another Ivan Lins song, A Gente Merece Ser Feliz, (The People Deserve To Be Happy). She shows her prowess singing in Portuguese with a big band sound with Neal Miner on bass, Rick Montalbano on drums, Romero Lubambo on guitar, Gil Goldstein on accordion, Rogerio Bocatto on percussion, Sheryl Henze on bass flute, Barry Crawford on alto flute, and Richard Locker and David Eggar on cello. The release changes tempo with the Lennon/McCartney song, Golden Slumbers/Long and Winding Road, followed by When She Loved Me, written by Randy Newman, Born To Be Blue with music by Robert Wells and lyrics by Mel Torme, and the song Close, with music by Larry Goldings and lyrics by Cliff Goldmacher. Jane segues into the slow and lovely Night Night Stars, which she wrote, that opens with Michael Kanan on piano as an introduction to Jane's gorgeous vocals and lyrical styling. The release continues with the Hoagy Carmichael/Jane Brown Thompson song, I Get Along Without You Very Well, followed by the Joe Raposo song, Sing, and I Wanna Be With You. The song, What Are You Doing The Rest Of Your Life, lyrics by Alan Bergman and Marilyn Bergman and original music written by Michel Legrand, makes for a stunning close to this heartfelt release. 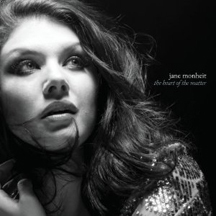 Websites where you can procure Jane Monheit - The Heart Of The Matter are Amazon, Barnes & Noble, and CDUniverse. Follow Luxury Experience on Facebook at www.Facebook.com/LuxuryExperience. © May 2013. Luxury Experience. www.LuxuryExperience.com All rights reserved.